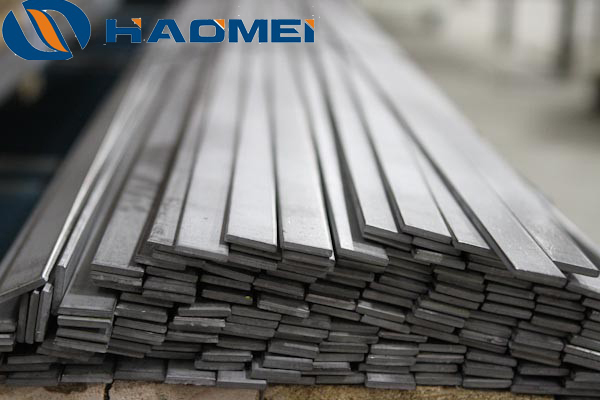 6061 aluminum flat bar is heat treated strengthen alloy, with good formability, weldability and machinability, at the same time with moderate strength, after the annealing can still maintain good operability. The main alloy elements are magnesium and silicon, and form Mg2Si. If it contain a certain amount of manganese and chromium, they can neutralize the bad role of iron. Sometimes add a small amount of copper or zinc in order to improve the strength of the alloy, but not reduce the corrosion resistance significantly. Conductive materials have a small amount of copper to offset the adverse effects of titanium and iron on the conductivity. Zirconium or titanium can refine the grain and control the recrystallization structure. In order to improve the machinability, lead and bismuth can be added. 6061-T651 is the main alloy of 6000 series alloy, it is the high-quality aluminum alloy products after heat treatment and pre-stretching process. Its strength can not be compared with the 2000 and 7000 series, but its has more characteristics of magnesium and silicon alloy, so it has good processing performance, excellent welding characteristics and electroplating, good corrosion resistance, high toughness and deformation after processing, the material is not defective and easy to polish, easy to color film, excellent oxidation and other excellent features. 6061 aluminum flat bar typical application are space fixtures, electrical fixtures, communications, and is also widely used in automated mechanical parts, precision machining, mold manufacturing, electronics and precision instruments, SMT, PC board solder carriers and so on.